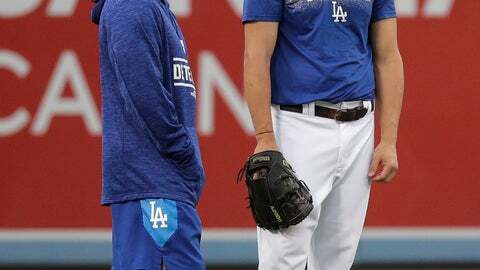 LOS ANGELES (AP) — Clayton Kershaw says he accepts the reasons he was given for not starting Game 1 of the National League Division Series. Whether the three-time NL Cy Young Award winner agrees with them may be altogether different. The Los Angeles Dodgers chose to go with Hyun-Jin Ryu in their series opener against the Atlanta Braves on Thursday. Kershaw is set to pitch Game 2 on Friday. “I wouldn’t really consider it a gut punch,” Kershaw said Thursday in his first public comments on the topic. Manager Dave Roberts says he and pitching coach Rick Honeycutt delivered the news via conference call to Kershaw, who has started eight of the Dodgers’ past 10 postseason Game 1s. If Kershaw is miffed, he’s keeping it to himself. Roberts says the vibe between the two of them is “great.” Kershaw can opt out of the final two years of his contract after the World Series. Calling Kershaw “this generation’s best pitcher,” Roberts reiterated the decision to go with Ryu was that it allows both pitchers to have five days’ rest between starts. If Kershaw had gone first, he would be on four days’ rest, while Ryu would be on six days’ rest for Game 2. Kershaw said he asked Roberts why he wasn’t starting and received an answer. However, he declined to share it. Ryu has posted a better ERA (2.81) in his three career postseason games than Kershaw (4.35) in his 24 playoff games. The South Korean was 7-3 with a 1.97 ERA in the regular season. Fellow lefty Kershaw was 9-5 with a 2.73 ERA and a team-high 155 strikeouts. Ryu had an edge over the final month of the season, posting a 1.88 ERA after overcoming a groin injury. Kershaw had a 3.89 ERA in September. “Hyun-Jin has had a great season and he’s pitched really well for us,” Kershaw said. At 30, Kershaw hasn’t shown the same zip with his fastball this season and he’s been on the disabled list for three consecutive seasons with back issues. If the series goes to a deciding fifth game, Roberts would again have to decide between Ryu and the ace that has been the face of the franchise for years.